Lots of excitement around the lake yesterday. A wild-fire is burning two miles from Quail Lake State Park in southern Utah. The fire is burning right up the side of a mountain and we are actually getting ash from the fire falling on cars and RV’s here within the campground. This has been our first season as camp hosts here in Utah so Bill and I have never seen anything like this before. While it is very sad that a wild-fire is burning and destroying the landscape and threatens homes etc. we were excited to be able to witness the heroic efforts of those who are putting their knowledge and skills to work to help fight and/or contain the fire. In order to accomplish this helicopters were called in to “dip” water from Quail Lake and carry it over the mountain to drop on the fire. 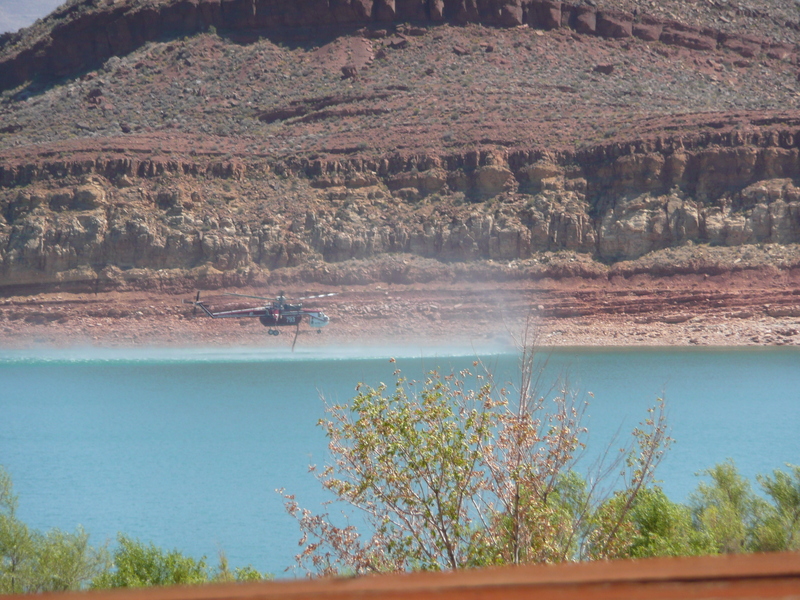 This picture below shows the first helicopter “dipping” into the lake. 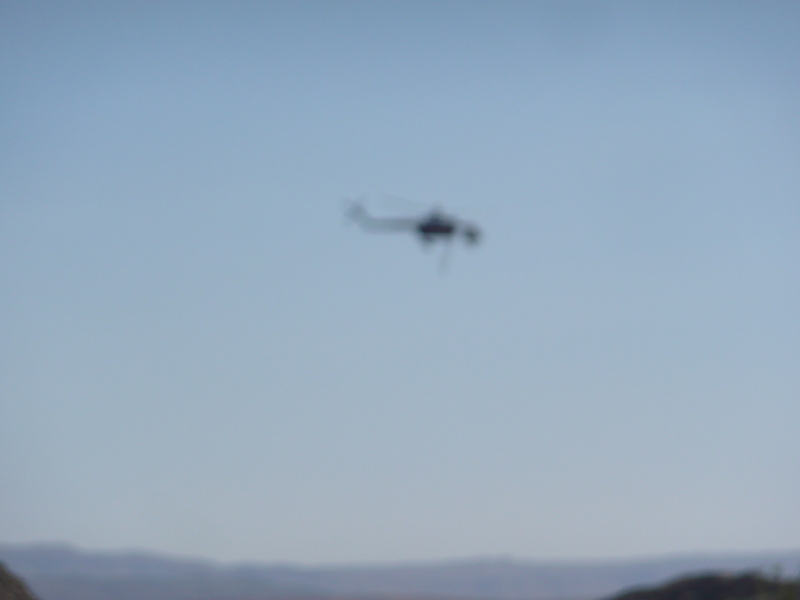 This next picture shows the helicopter taking off to drop the water on the fire. It is a little fuzzy but the whole “dipping” episode takes place in a matter of seconds so by the time you have your camera pointing in the right direction to take the picture, the helicopter has “dipped” the lake and is rushing off to the fire. This “dipping” went on several times throughout the morning and afternoon. In fact, in order to allow the helicopter pilots safe access to the lake, we had to have the boat gates closed and locked and not allow anyone access to the lake all day yesterday. I was working the gate booth and had to turn many, many Friday night boaters away. We did allow campers in that had reservations but they were told that they would not be allowed to launch their boats until we were given the all clear which would hopefully be today. I’m happy to say that the boat launch area is open again today and boaters are on the water which hopefully means the fire is being contained. We can still see white smoke rising over the mountain but because I’m not working today, as of this writing, I have not be given a status of the fire containment level. Keeping all front line first responders in our thoughts and prayers as they put their lives on the line to help save others. Traveling through Oregon we came across a fire fighters camp and what an eye opening experience to see the mass amounts of tents and set up for fighting these fires. There’s nothing like seeing something like this in person to have even more appreciation of the impact. This is what I love about your new experiences…seeing firsthand and sharing with us…thank you! LOVE and MISS you!